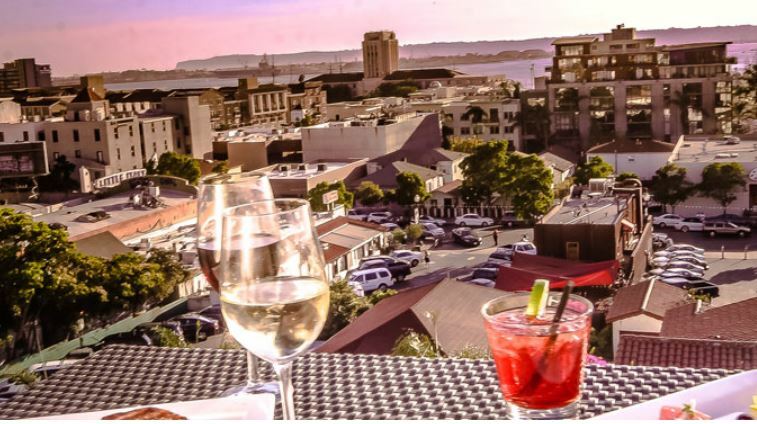 There’s so much to see and do in Washington DC (See the Contest below to help you plan.) However, spending days running from museum to monuments can be overwhelming. Where can you get out into nature to relax, recharge, and still enjoy National Treasures? It’s closer than you think. Take a ten-minute drive from the Capitol Building and you can wander a 446-acre wonderland – the US Arboretum. The palette of natural beauty shifts year-round. It’s free to attend and, most wondrous for me, where you’ll find the National Bonsai and Penjing Museum. Arboretum: A plot of land on which many different trees or shrubs are grown for study or display. Japanese Red Pine Pinus densiflora. Gift of the Imperial Household, Japan 1976 In training since 1795! If you’ve ever marveled at pictures of gnarled miniature trees from Japan or walked around carefully nurtured specimens, imagine what it’s like to see dozens. Many in the National collection are over a hundred years old but less than four feet high! How they got there and why they’re in the US Arboretum at all is a sweet story. Admiring the Bonzai inside the US Arboretum. In 1976 the US threw a big party – the American Bicentennial Celebration of Independence. As with any big birthday celebration, there were presents. International friends showered gifts on the country. The people of Japan gave something unique from their culture to represent peace between our two nations. Imagine attending the formal presentation of fifty-three bonsai trees from the Nippon Bonsai Association! 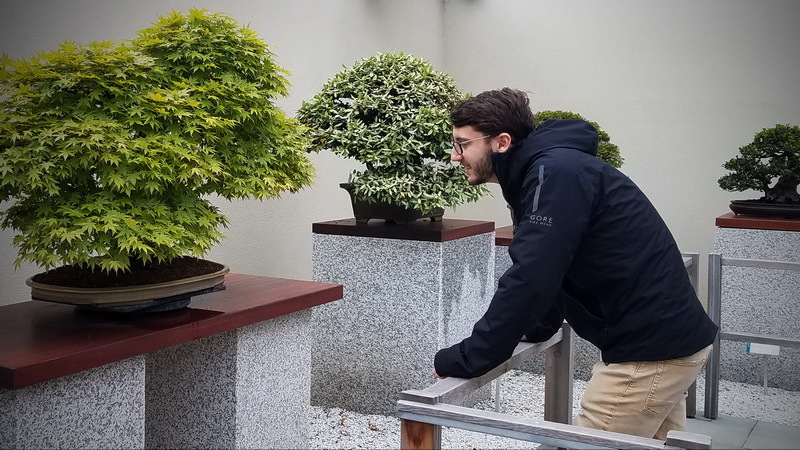 That living tribute seeded the National Bonsai and Penjing Museum. Today the artistically trained trees are arranged in three distinct galleries and each has a meditation garden. Penjing is the ancient Chinese art of depicting artistically formed trees, other plants, and landscapes in miniature. The National Capitol Columns are on the Arboretum grounds and one of the more curious parts of the US Arboretum. They weren’t built for the hill in Ellipse Meadow but as part of the US Capitol building when it was constructed in 1828. However, the builders realized that the columns couldn’t support the dome and just didn’t look right. They were removed but didn’t find a final resting place until 1980. Today everyone wants a picture with the columns. Elaine’s Instagram moment in front of the Capitol Columns. 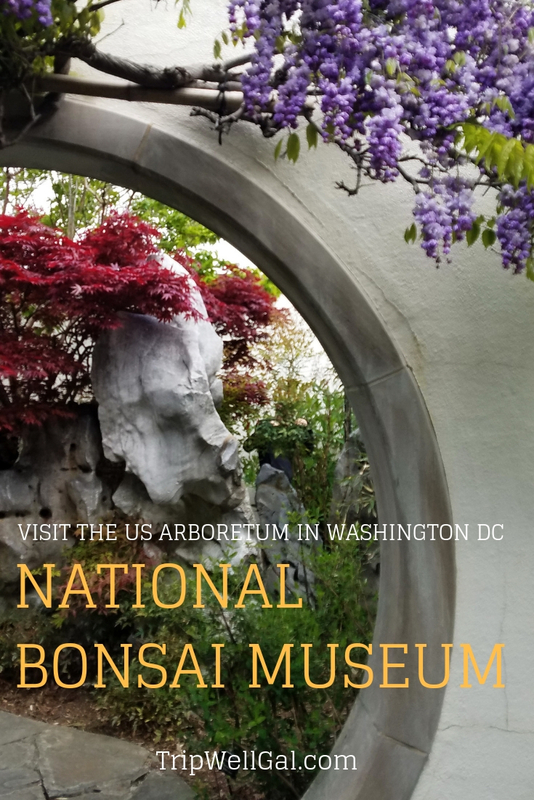 The US Arboretum is planted with significant collections like the National Herb Garden, the National Grove of Trees and next to the central building, the open air Bonsai, and Penjing pavilion. 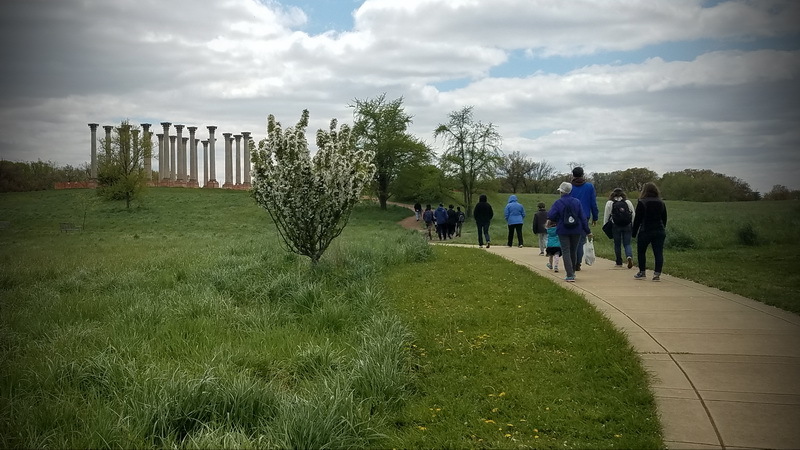 I look forward to returning one day in a different season to explore Fern Valley, the Friendship Garden and perhaps run across a meadow full of flowers. In the center of the US Arboretum is a public building dedicated to research. Established in 1927, of the US Department of Agriculture (USDA) works there to find solutions to agricultural problems of national priority. You can find out more at the ARS website. The Administration building is built to mimic a stand of trees. It’s full of information and educational displays. The Arbor House gift shop is packed with goodies for gardeners and unique souvenirs. There are classes, tours, and volunteer opportunities as well. November through December: Hollie berries, conifers, boxwood, and camellias. The easiest way to get to the Arboretum is by car. Parking at the museum is free and easy. A free shuttle moves between the various lots and the heart of the park. There is a Metrorail station relatively near but you need to catch a bus and then walk about four blocks to the park entrance. Detailed directions are on the website. I only wish I were using GPS My City when I planned my visit to Washington DC or Rome or Quebec! 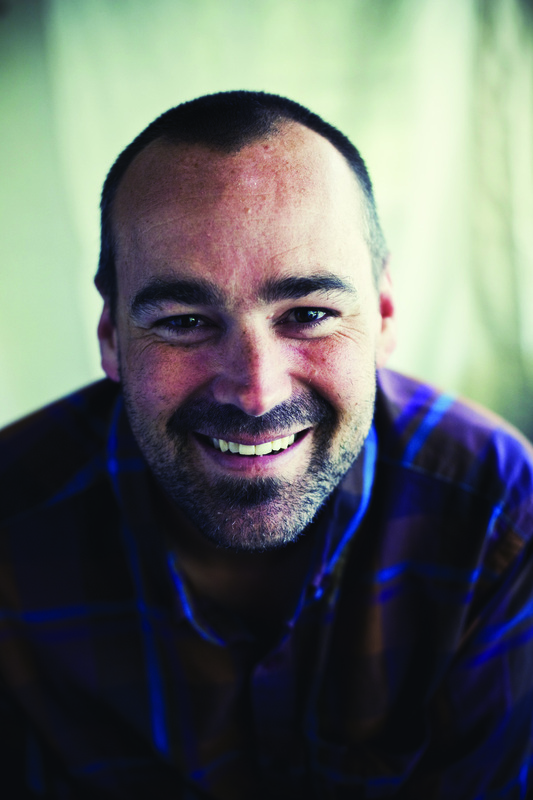 The App helps to set up guided or walking tours. It’s a great way to get your bearings in any city you may visit. To Enter: I’m giving away ten subscriptions. Each annual subscription, which normally costs $18.99 on the app store, allows access to all the walking tours in 1,000+ cities worldwide. Leave a comment below and I’ll select the ten winners by random from all comments. The winners will be announced in my December 15th blog post. Good luck! Wow…. looks like I need to start exploring the area outside of the Mall. I think to truly see DC you need more than a weekend! Thanks for the inspiration! DC has lots going on throughout the area. Hope you get a return trip. Washington DC has too many things to do, I need 365 days straight to even just start making a dent. I do love trees and botanical gardens so I am sure I would absolutely love the arboretum. I love doing walking tours sound the app sounds very interesting! Thanks, Andi. It’s true about seeing DC. I feel like that in most big cities! What a cool and unique spot in DC to get away from the city! I’ve always loved Bonsai as my Dad used to have them when i was growing up. They’re so adorable haha. Love the photos and I’ll definitely keep this spot in mind! Nice that your father was into Bonsai. Glad you enjoyed the photos. I lived in DC for 3 years when my husband was in school and I’m not sure how i ever missed the US Arboretum in Washington. Ha-maybe because it’s hidden! What a beauty. I’m make sure to find it on my next long overdue visit to the area. What a gem. You’d love it, Alison. I think it’s under-the-radar because it’s foremost a research facility and secondary for the public. That’s the vibe. The Bonsai though knocked me out. I’d recommend going when it’s warm enough to walk about comfortably! I truly stumbled upon it as a stop in between NASA and DC with my son who was working in Maryland at the time. There are different things blooming through the year but go when you can really get outdoors without bracing for wind or cringing from cold. 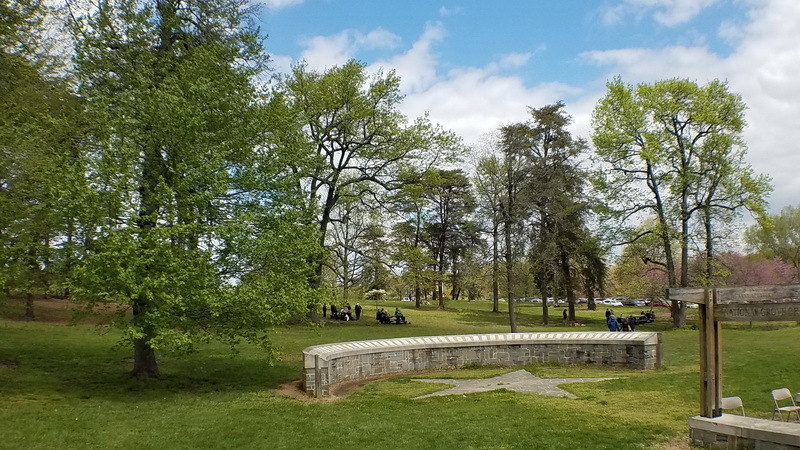 I love trees and parks, and the National Arboretum would be right up my alley — I didn’t know that it was SO close to the Capitol. Amazing that they set aside that much space so close in, and how wonderful. Your photographs of the azaleas in the wooded area are beautiful. What a great time to visit! It was a wonderful antidote to wandering around DC for days! Hope you can go sometime. 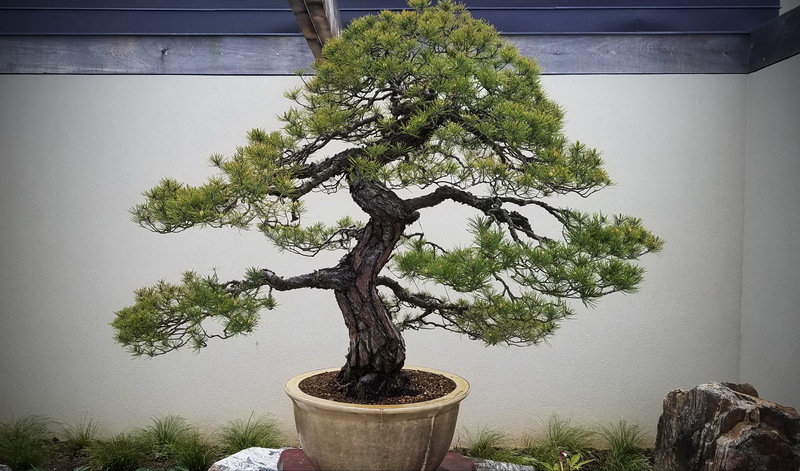 For me, the biggest surprise at the National Arboretum was definitely the bonsai collection. It’s a don’t miss. Absolutely. My son didn’t even see it and then it was, where’s Mom? We reconnected in a meditation garden. Wonderful. I’m embarrassed to admit that despite several trips to DC, the Arboretum has never hit my radar. There’s so much to see there! But on so many trips, I do need a break from the hustle-bustle and need some greenery. I’ll keep this in mind. You got the gist of my post. It’s a wonderful place, still full of history and so much natural beauty. Oh my gosh, this is right up my alley for interests during travel!! I would absolutely love to visit US Arboretum – I’ve never been to DC but tbh I’m kind of surprised that I didn’t know we had a 446 (massive!) acre arboretum. Maybe I will save this for spring when the cherry blossoms are out?! Yes, spring would be wonderful and they may have cherry blossoms but those trees were a gift from Japan and most of them are along the waterway near the Capital. Got it! 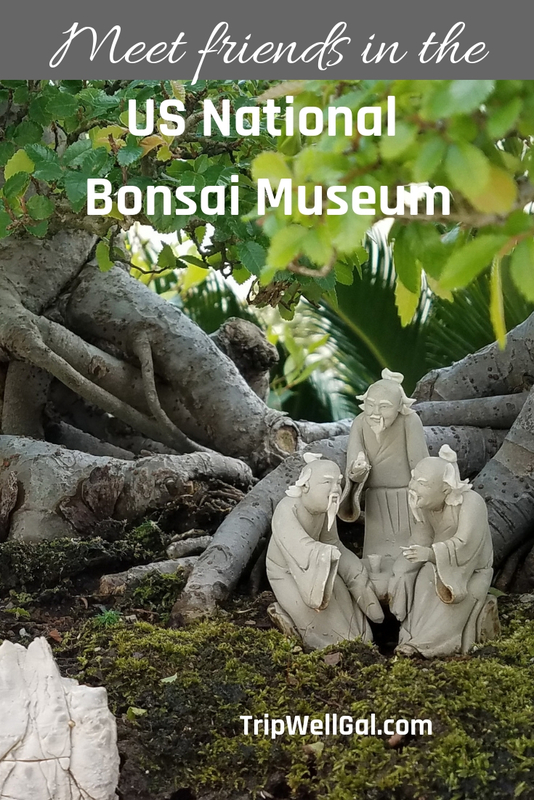 I love that they call it a Bonsai Museum. Unlike any other you may visit – it’s open air and very much alive without glass panels between you and the collection. I love the gardens around DC. I haven’t been to the Arboreeetum yet but it’s now on the list. I used to go to DC all the time (like three times a year) but with the new project we never go there. I love watching the season turn in DC. It reminds me of my childhood in Ohio. How wonderful that you grew up with seasons! I’m such a SoCal gal. It’s one of the reasons that living and working in SE Alaska was so exotic in my twenties. I’d love to return and see more gardens in the area. Been to DC several times and never made it here. Your photos and narrative, tell me it is time to go back and visit! Thank you, Jackie. That was my intention. It’s really a must see place. Not like any other museum you might visit for sure! Glad you found this helpful and I hope you get a chance to visit. The US Arboretum looks like a delightful place to spend a few hours walking around in the fresh air and enjoying nature. So wonderful to see all that nature being lovingly cared for and preserved. Plus wow to the bonsai examples! You got it, Sara. I was truly knocked out by the growth and collections. Wow, I’m ashamed to admit how many times I’ve been to DC (but only twice since college so most of them I was a kind in my defense. LOL) and didn’t know about the Arboretum. 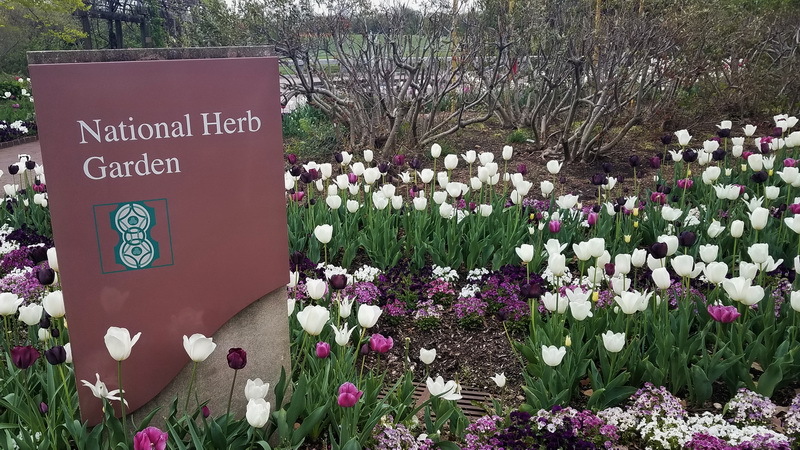 I’ve been to several arboretum gardens (including the one in my own city) but just never thought about there being one in DC. The photos are beautiful. As a bicentennial baby, I would have to go see those bonsai trees! The GPS My City app sounds cool too! Thanks, Heather. I hope you win the App! Learned something new…penjing from China! Thought it was exclusively about bonsai from the Japanese. 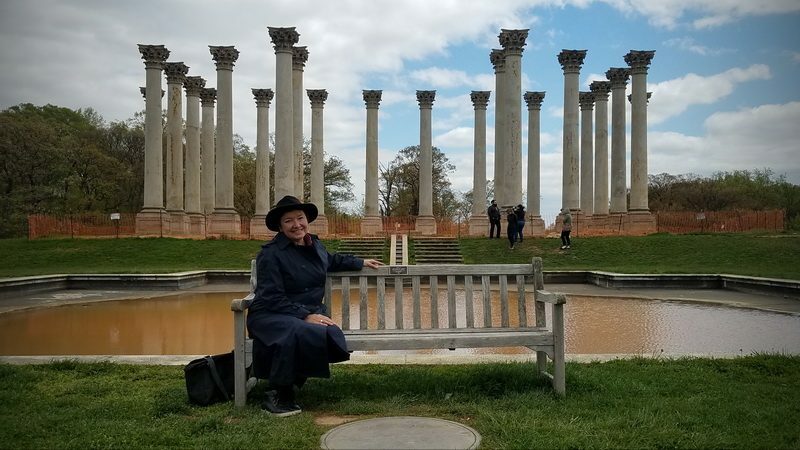 Haven’t been to the Arboretum so I would be thrilled to visit this since I am a lover of trees And I would like to have my Instagram picture with those columns, too! I think you are a prime candidate for becoming an Arboretum fan. When I visited Washington DC, I wasn’t aware that there was something like the US Arboretum with so much greenery and such lovely plants. This place looks pretty amazing. I loved the architecture in DC and the museums were pretty cool too but this looks like a great place to relax. You connected with why I found it so compelling too. Thanks, Medha. Beautiful Elaine! You cannot beat trees. Really. We spent a few weeks in the greenest NYC neighborhood a few weeks back; Sunnyside Gardens, Queens. Goodness did having ample trees around change the energy. Couldn’t agree more, Ryan. I’d love to see Sunnyside Gardens. There’s nothing like being out in nature. The last time I was in Washington, D.C., I visited the U.S. Botanical Garden which was easy to walk to from our hotel near the White House. I guess it was actually a bit of a hike, but definitely doable. However, I didn’t realize there was a separate arboretum. Between Mr/Dr. Excitement’s conferences and the NIH in nearby Bethesda, we get there at least once or more each year and I usually have some free trailing spouse time while he’s conferring with his science peeps, so I’m glad to learn of this arboretum. I’m hopeless at growing plants, but I love looking at plants and trees and seek out gardens wherever we go, so this is definitely going on my “do visit” list. I’ve pinned it to a DC Pinterest board so I’ll be able to find it again. Thanks for sharing this info. PS: I’ve never heard of that walking tour app. Sounds interesting. It sounds like this has made your DC itinerary. Thanks for pinning. I join my guy for conferences too. It’s how I discovered Spokane’s gardens too. Aren’t we fortunate? I lived in the DC area for many years and didn’t know about this hidden gem. How breathtaking! It’s a local gardener’s secret I think! Thx for the fabulous post, Elaine. I’ve never been to Washington DC. But when I do go, I’d love to visit the Arboretum–especially the Bonsai Garden, as I have a bonsai at home. You ‘have’ Bonsai! How wonderful. I kill anything that takes skill to grow indoors but did keep several orchids going until mites killed them. You’d be amazed at these outdoor specimens in DC. Love the National Arboretum and haven’t been there in years and years. 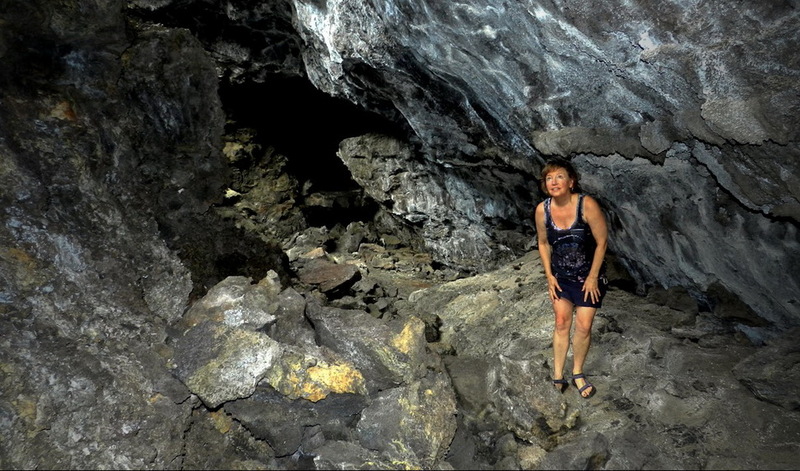 It’s really a spectacular place — just sorry to see it still isn’t very accessible unless you have a car! Haven’t tried GPS my city (I’ve looked at it, but haven’t actually tried it). Sounds like a useful app. Thanks, Cindy. Glad to know you’ve been there and yes, public transport leaves something to be desired. I’d probably take the train as far as possible and Uber from the station. Beautiful! My husband has been to the Dallas Arboretum while he was a student at UT about a decade ago. 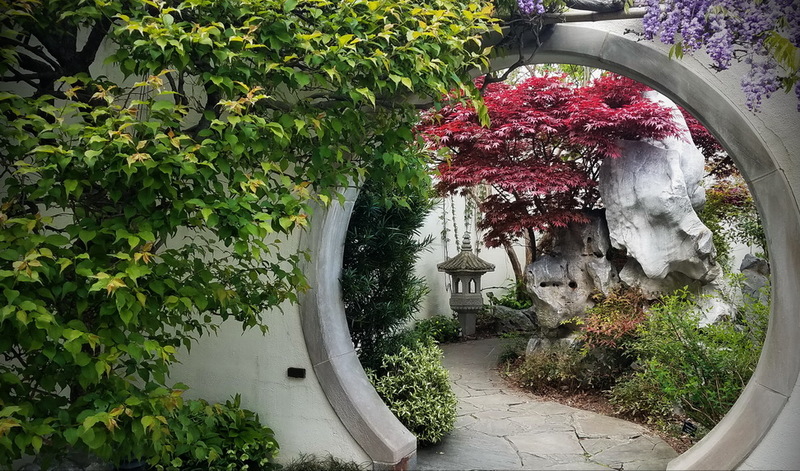 We want to visit the US soon so this will definitely be on our list if we visit D.C..
I’m so glad that Arboretum’s are on your radar for your upcoming trip. Those and Botanical Gardens are certainly on mine. Are-Bore-eee-tum! And yes, those trees are hundreds of years old!! I’m not good with delicate plants but love succulents out here in dry Cali. They come and go, but most are staying!! I love trees and gardening, so the hidden US Arboretum in Washington DC sounds like somewhere I need to visit. I’ll probably go in mid April to see the Woodland wildflowers and lowering cherries. Great find! I’m so glad you’ll have a chance to see these gardens. I’d love to return for full blooms and warmer weather. 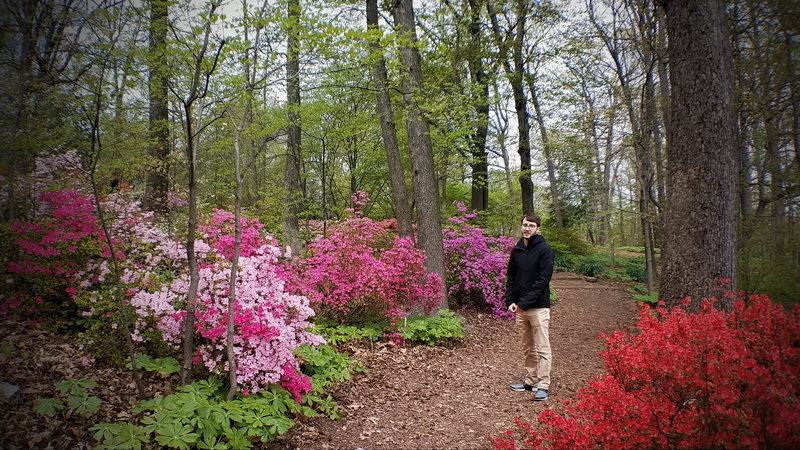 I had no idea there was an arboretum in Washington, DC! Another interesting thing to see in the city! The columns almost look like the Parthenon in Greece. Thank you for sharing the history of the columns, it’s always nice to have the backstory for a beautiful backdrop. And it looks like I won’t have to fly to Japan to see a bonsai tree. My wife and I will have to visit in May so we can stop and smell the roses. Thanks for sharing. There are also Bonsai trees in Boston in a special garden. I do hope you get to the DC Arboretum in May. It should be incredibly colorful in spring. First of all, I absolutely love the first photo on this post. You could really sell it. Bonsai trees have always intrigued me. They looks so delicate, but since they live so long, they must really not be. The US Arboretum seems like a great place to escape the crazy of Washington DC. I wish I had known about it when I visited, although I don’t know where I would have fit it in. One day I’d like to go back. Also, that app sounds so cool! Pick me! Thanks, Kathleen. I’m honored that you liked the picture. There were several meditation gardens each more beautiful than the next. One day I hope you return and visit for yourself. This makes me want to go back to DC. I’m a tree hugger since childhood. The app sounds so useful! I love your Instagram moment, Elaine! I had no idea they have such a beautiful garden in Washington DC. I’ve been in D.C. so many times, I could have visited it if I knew. Truth is that our Nation’s Capital is not short of amazing things to do and there is always something new to discover there. Thanks for sharing this. Thanks, Anda. There are so many things to do in DC and the area. I’d love to return again and again. Do return, Brooke. The Bonsai are worth the trip and there’s something growing spectacularly year round. This is exactly the kind of place I love to visit! I love how the Capitol columns weren’t destroyed but given a new home, and as my husband grows Bonsai trees, I know he’d enjoy visiting as well. I so admire your husbands skill with Bonsai. He’d marvel over the collection in DC. It was a tickle to discover the history of those columns. They seemed so random when I was there! Wow, that first photo reminded me of Yu Garden in Shanghai! I didn’t expect it to be in DC as well. What a beautiful respite away from all the monuments and crowds of DC. I’m completely fascinated by Bonsai, lol. I feel like I would struggle to get it right and end up with a completely bald tree. lol. Absolutely stunning photos. Thanks so much Sara. I took so many pictures that my son kept complaining about my little journalism project! It’s amazing to see how healthy and loved those trees are. Ancient too!